We compare unsubsidized 2016 nongroup marketplace premiums to the average employer sponsored insurance premiums in all 50 states and 73 metropolitan areas. We adjust second lowest cost nongroup marketplace premiums to account for the differences in actuarial value, induced utilization, and age distribution of enrollees. We find that nationally, nongroup marketplace premiums are 10 percent lower than the average employer sponsored insurance premium, after the adjustments. There is variation at across states and metropolitan areas, but more than ¾ of states and more than 80 percent of metropolitan areas having lower marketplace than employer premiums. Nationally, the average second-lowest-cost silver nongroup premium (single coverage) was 10 percent lower than the average employer-sponsored insurance premium in 2016 using the actuarial value, utilization, and age-distribution adjustments. In 39 states including the District of Columbia, the average 2016 second-lowest-cost silver nongroup premium (the Marketplace “benchmark” premium) was lower than the average employer-sponsored single premium when using the actuarial value, utilization, and age-distribution adjustments. The exceptions are Alaska, Arkansas, Delaware, Georgia, Louisiana, Missouri, Nebraska, North Carolina, South Dakota, Vermont, West Virginia and Wyoming. Out of the 32 large metropolitan areas we studied across the country, four—San Francisco, Atlanta, New Orleans and Charlotte, North Carolina—had higher nongroup premiums (second-lowest-cost silver) than the average for employer-sponsored insurance when using the actuarial value and age-distribution adjustments. Critics of the Affordable Care Act (ACA) and its associated reforms have been extremely vocal about their perceptions that Marketplace nongroup insurance premiums are too high.1 In addition, many have set expectations for high premium increases in 2017 relative to 2016, stoking anxieties about the long-term viability of coverage obtained through the Marketplaces (Cox et al. 2016). As we and others have documented, since nongroup market reforms were implemented in January 2014, Marketplace premium increases have varied tremendously across the country, as has their annual growth (Blumberg, Holahan, and Wengle 2016).2 In 2016, for example, 48 percent of the US nonelderly population lives in premium rating areas where the lowest-cost silver premium either decreased or increased by less than 5 percent. However, 36 percent of the population lives in areas where lowest-cost silver premiums increased 10 percent or more. Similar premium growth variation can be expected in the coming year. Premium levels and premium growth are strongly associated with the nature of competition in each market. Although the ACA’s premium tax credits limit premium contributions for Marketplace consumers with incomes at or below 400 percent of the federal poverty level (FPL),3 the focus of criticism is that the full, unsubsidized premiums available in the Marketplaces are high—a sign that the pool of nongroup insured are sicker than expected and that the new markets simply do not work. Those with incomes above 400 percent of FPL face the full premiums, and the higher the unsubsidized premiums, the higher are the federal government’s costs for the premium tax credits. To put the level of nongroup premiums in some perspective, we analyze unsubsidized nongroup Marketplace premiums compared with unsubsidized average employer-sponsored insurance premiums in the same geographic areas, adjusting for differences in actuarial value (and health care service use associated with different actuarial values of coverage) and the age distribution of enrollees. We compare nongroup premiums with employer premiums since employer coverage has long been considered a natural risk pooling mechanism: roughly 100 million workers (about two-thirds of the working population) plus their dependents were enrolled in an employer plan in 2014. Enrollment is diverse, likely reflecting the nonelderly, nondisabled population, although employer coverage is disproportionately available to higher-income compared with lower-income workers. Workers with offers of employer-based coverage enroll at high rates, approximately 80 percent (Abramowitz 2016). Yet, they also represent a market less likely to enroll a disproportionately high-cost population than is the nongroup insurance market, and thus they are more likely to reflect average costs for a broad representation of the population. They also are an insurance market with historically lower rates of administrative cost (Merlis 2011), suggesting they enjoy a more efficient market in which to purchase insurance. We find that in most states and in most metropolitan areas, Marketplace premiums are lower than those for employer-sponsored plans. Although nongroup premiums tend to include higher administrative costs per enrollee than the average employer plan, Marketplace insurers also tend to offer narrower provider network plans than their employer-based counterparts, with the more limited networks leading to significantly lower premiums in many cases. In addition, some nongroup insurers may have underpriced their products at the outset of the reformed market, and some may still be adjusting their premiums to appropriately reflect their enrollees’ health care costs. We measure single (worker-only) employer premiums using the state and metropolitan-area averages provided in the MEPS-IC’s published data tables for 2015 for all employer sizes.4 The MEPS reports statewide average employer premiums for each state, the District of Columbia, and 73 metropolitan areas. We report only 32 of these 73 metropolitan areas for ease of display, but findings on the other 41 are consistent with those presented in the text (table A.1, at the end of the brief). We also use the MEPS-IC published tables to compute the national annual percentage change in average employer premiums from 2010 to 2015, the average of which is 3.8 percent. We apply that 3.8 percent increase to the 2015 premiums reported in MEPS-IC, to compute estimated 2016 average employer premiums. These are the premiums used as a comparison with Marketplace nongroup premiums for our analysis. Some evidence from the Milliman Medical Index, however, shows that the growth in health care spending by enrollees covered by employer-sponsored insurance has increased by 4.7 percent between 2015 and 2016 (Girod, Hart, and Weltz 2016); if this estimate is accurate and nationally representative, our estimates of 2016 employer-based premiums may be low, making our findings conservative. Our measure of nongroup premiums relies, at its core, on the second-lowest-cost silver premium for single coverage in each rating area of the country.5 Enrollment by Marketplace plan is not available for most states, so we cannot compute a weighted average Marketplace premium. However, nongroup enrollment is heavily concentrated in silver (70 percent actuarial value) coverage and silver-level coverage is heavily concentrated in the two lowest-cost options available (Holahan, Blumberg, and Wengle 2016). This is because advanced premium tax credits are tied to the second-lowest-cost silver plan and cost-sharing reductions are only available to those purchasing silver coverage. The second-lowest-cost silver option in a given area is, therefore, a reasonable first approximation of an average premium in the nongroup Marketplaces. We then adjust this 2016 nongroup single-premium measure upward to account for employer-sponsored insurance having lower cost-sharing requirements (i.e., higher actuarial value), on average, than a silver (70 percent actuarial value) plan. According to an analysis of 2010 data by Jon Gabel, employer plans had an average actuarial value of 83 percent.7 We therefore multiply each nongroup premium measure in our study by 1.186 (83 ÷ 70) to take into account that that nongroup premiums can be expected to be lower than employer premiums because they have a lower actuarial value on average. We make an additional upward adjustment in our nongroup premium measure to take into account that those with higher actuarial value insurance plans tend to use more health care services. The Centers for Medicare & Medicaid Services produced induced-demand adjustment factors for the ACA’s risk-adjustment methodology; we use their relative adjustment factors for gold- (80 percent actuarial value) and silver-level coverage to compute this adjustment. The centers’ adjustment factors are 1.08 for gold coverage and 1.03 for silver coverage, and, as such, we adjust our nongroup premium measure by 1.0485 (1.08 ÷ 1.03) to approximate the utilization difference between average employer coverage and nongroup silver coverage (Pope et al. 2014). Although gold-level coverage is considered to have an actuarial value of 80 percent, in practice, the Department of Health and Human Services permits a de minimis variation of plus or minus 2 percentage points around the levels at each tier. As such, gold-level coverage for which the gold risk-adjustment factor was computed can vary from an actuarial value of 78 percent to 82 percent. It is thus appropriate to apply in our circumstance, since we intend to make an induced demand adjustment between plans with an actuarial value of 68 to 72 percent, up to approximately 83 percent. We have no reliable basis on which to adjust for any differences in covered benefits that might exist between typical employer plans and ACA-compliant nongroup insurance coverage. However, all ACA-compliant plans, including those sold through the Marketplaces, must cover the essential health benefits delineated in the law. Each state had the opportunity to choose its benchmark plan for essential health benefits from four 2012 options: one of the three most enrolled small-group plans in the state, one of the three most enrolled state employee health plan options, one of the three most enrolled federal employee health plan options, or the most enrolled HMO offered in the state’s commercial market. The most enrolled small-group plan in the state was the default option for states not choosing explicitly. Regardless of the option chosen, however, the benchmark had to cover all 10 categories of essential health benefits delineated in the law.8 Forty-five states chose a small-group insurance plan as their benchmark (or defaulted to its use), two chose a state employee plan, and four chose a commercial HMO plan. Thus, in most cases, the nongroup benefit plan benchmark is in fact an employer plan; in all cases, the options available include comprehensive benefits. Thus, we assume that the typical benefits covered by Marketplace plans are approximately equivalent to those provided by the typical employer-sponsored plan. However, to the extent that employer-sponsored plans, on average, include more or fewer covered benefits than do ACA-compliant nongroup plans, we have under- or overadjusted the nongroup premium measure used here. Thus, the second-lowest-cost silver premium for single coverage, increased by a factor of 1.186 to adjust for the higher actuarial value of typical employer coverage, further increased by a factor of 1.0485 to adjust for greater use of services with a higher-actuarial value-plan, then adjusted to match enrollees’ age distribution in employer-based insurance, serves as our measure of 2016 nongroup premiums used to compare with 2016 average single employer premiums. Table 1 provides data that allow us to compare state average employer-based insurance premiums (adjusted from 2015 to 2016) with the state average second-lowest-cost Marketplace silver premium (adjusted upward to take actuarial value differences and utilization differences into account, with the average reflecting the age distribution of those with employer-based insurance); the District of Columbia is counted here as a state. We refer to the adjusted average second-lowest-cost premium as the average nongroup premium for ease of exposition. By these measures, average nongroup premiums are 10 percent below average employer premiums nationally, although relative differences vary across states. In 39 states (76 percent), average nongroup premiums are lower than average employer premiums. These states range from Connecticut, Montana and North Dakota, where average nongroup premiums are 1 percent below average employer premiums, to Massachusetts, where average nongroup premiums are 35 percent below average employer premiums. In four states—Delaware, Georgia, Missouri and Nebraska—average nongroup premiums exceed average employer premiums by 5 percent or less. In the eight remaining states, average nongroup premiums exceed average employer premiums by larger amounts—Arkansas (6 percent), South Dakota and West Virginia (7 percent), Louisiana (8 percent), Vermont (15 percent), North Carolina (25 percent), Wyoming (31 percent) and Alaska (68 percent). Although the simple correlation between employer and nongroup premiums is not terribly strong (0.57, data not shown), we find several instances when a state with high nongroup premiums relative to the national average also has high employer premiums relative to the national average. 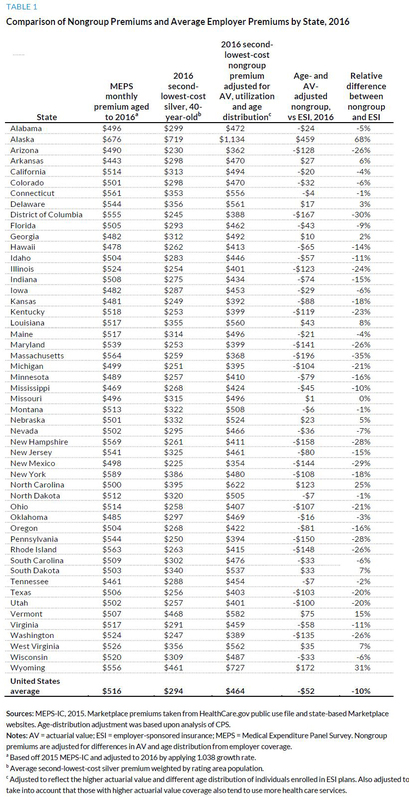 In other words, relatively high-cost nongroup premium states are sometimes high-cost medical care states in general. These include, for example, Connecticut, Delaware, New York, West Virginia and Wyoming. The difference between Vermont’s average nongroup premiums and employer group premiums is probably the most problematic in pursuing an apples-to-apples comparison. Vermont’s nongroup insurance market uses pure community rating (i.e., premiums are not permitted to vary by age). The state’s large employer market, however, does not. Thus, the premium rating differences between the Vermont group and nongroup markets are at one extreme of the distribution, making them less comparable to each other than are the other states’.9 Yet, New York also uses pure community rating in their nongroup and small-group insurance markets, yet the state’s nongroup premium average is still well below its employer premium average, possibly reflecting the substantially more competitive nongroup market in New York. 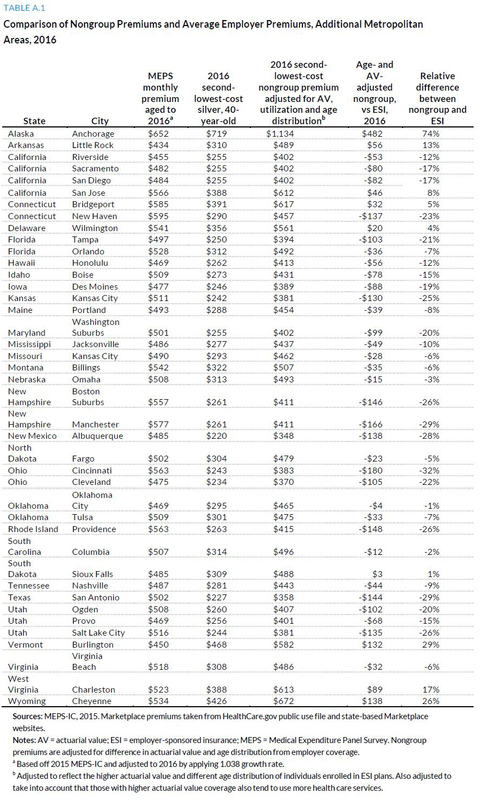 Alaska has the most expensive nongroup Marketplace premiums in the country for the 2016 plan year. Not all of this is attributable to Alaska’s higher cost of living, provider shortages, and high transportation costs, as shown by the 68 percent relative difference (depending upon the adjustment used) between average employer and nongroup premiums there. Several potential market factors can explain this large differential. First, Alaska has a very small nongroup insurance market, with only about 23,000 enrollees, making it difficult to adequately spread the costs of high utilizers of care (Office of the Assistant Secretary for Planning and Evaluation 2016). In 2015, Alaska’s Marketplace enrollment was only 70 percent of Urban Institute projections, 21,000 out of a projected 30,000 individuals.10 In addition, Alaska will have only one insurer (Premera Blue Cross Blue Shield) remaining in its nongroup insurance market in 2017, a reflection of the state’s low enrollment and high-average-cost insurance pool. To reduce nongroup premiums, attract more insurers, and stabilize the market, Alaska has developed its own state-funded reinsurance program and will operate a high-risk pool (the Alaska Comprehensive Health Insurance Association program), which officials hope will improve the risk profile of the nongroup market’s enrollees. North Carolina also has average nongroup premiums substantially (25 percent) above its average employer premiums. Unlike Alaska, North Carolina has had robust enrollment relative to Urban Institute projections, exceeding those projections in 2015 by 20 percent.11 However, insurer participation in the state’s Marketplace has been low, with only three insurers participating in 2016. There is no Marketplace competition from Medicaid managed care plans (an insurer type that we have found strongly associated with lower premiums and lower premium growth; Blumberg et al. 2016), and, given the recent announcement by Aetna that they will leave most of the state Marketplaces in which they currently participate, only Blue Cross Blue Shield may participate in the North Carolina Marketplace in 2017. With sparse competition, the insurer has little motivation to innovate and negotiate more favorable provider contracts to help provide lower premium options. Like Alaska, Wyoming had low Marketplace enrollment relative to Urban Institute projections, 80 percent of projections in 2015. In addition, Wyoming had only one participating insurer in 2016, Blue Cross Blue Shield of Wyoming. Weak insurance market competition and low enrollment rates that suggest adverse selection into the market may be at the source of the state’s high nongroup premiums relative to employer premiums. Table 2 provides data that allow us to compare 32 metropolitan-area employer-based insurance premiums (adjusted from 2015 to 2016) with that same metropolitan area’s second-lowest-cost silver premium (adjusted upward for actuarial value and associated utilization differences and the age distribution of employer insurance enrollees). Out of 32 metropolitan areas, 28 have nongroup premiums lower than the average employer premium, ranging from 3 percent lower in Memphis to 43 percent lower in Pittsburgh. The exceptions are San Francisco, Atlanta, New Orleans and Charlotte.12 Nongroup premiums are 23 percent higher than average employer premiums in San Francisco, and nongroup premiums are about 29 percent higher than employer premiums in Charlotte (see the State-Level Findings section on the lack of insurer competition in North Carolina’s nongroup insurance market). 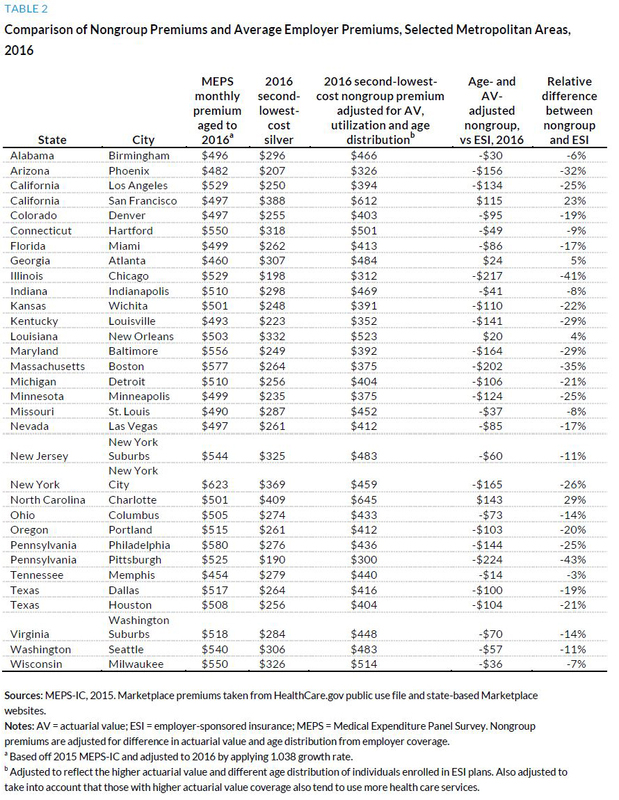 In 14 of the 32 metropolitan areas, nongroup premiums are at least 20 percent lower than the corresponding employer premiums. Premiums in the nongroup insurance Marketplaces attract considerable attention, with some concerned that average growth rates since 2014 are high in some areas and that this might signal a fundamental weakness with the new nongroup insurance markets. This analysis places nongroup Marketplace premiums in a context where we can compare them, apples to apples, with employer-based insurance. Our findings show that in more than 75 percent of states and more than 80 percent of the metropolitan areas we can study, nongroup premiums are actually lower than employer premiums in the same area, even though nongroup insurance tends to have higher administrative costs per enrollee than does average employer coverage. In fact, once adjusting for year, actuarial, and associated utilization differences, half of states’ nongroup Marketplace premiums are lower than their average employer premiums by double-digit percentages. Metropolitan-area findings are similar. In a previous analysis, we found that Marketplace nongroup insurance premiums tend to be lower in rating areas with more participating insurers and in those with Medicaid insurers or provider-sponsored insurers participating (Blumberg et al. 2016). Nongroup Marketplace premiums may tend to be lower because Marketplace insurers are more aggressive in offering narrower provider network plans than their group market counterparts. Other market characteristics may play roles, such as premium transparency and plan comparability. The large differentials between nongroup and employer premiums in many areas also may indicate that nongroup premiums continue to be underpriced in some areas; the large premium increases seen in several states may be part of the process through which these markets will reach a stable equilibrium. Thus, with few exceptions, the level and growth of nongroup premiums in the Marketplaces should not be interpreted as evidence that these new markets are weak. Nongroup insurance, when adjusted to make its premiums comparable to employer premiums, is much more often than not lower cost than the average coverage offered through employers. But the persistent, uncomfortable truth is that health care is an expensive commodity, regardless of the market in which one purchases it. Abramowitz, Joelle, and Brett O’Hara. 2016. New Estimates of Offer and Take-Up of Employer-Sponsored Insurance. Washington, DC: US Census Bureau. Blumberg, Linda J., John Holahan, and Erik Wengle. 2016. Increases in 2016 Marketplace Nongroup Premiums: There Is No Meaningful National Average. Washington DC: Urban Institute. Cox, Cynthia, Gary Claxton, Larry Levitt, Michelle Long, Selena Gonzales, and Nolan Sroczynski. 2016. “Analysis of 2017 Premium Changes and Insurer Participation in the Affordable Care Act’s Health Insurance Marketplaces.” Washington, DC: Kaiser Family Foundation. Girod, Chris, Sue Hart, and Scott Weltz. 2016. “2016 Milliman Medical Index.” Seattle: Milliman. Holahan, John, Linda J. Blumberg, and Erik Wengle. 2016. Marketplace Plan Choice: How Important Is Price? An Analysis of Experiences in Five States. Washington DC: Urban Institute. Gabel, Jon R., Roland McDevitt, Ryan Lore, Jeremy Pickreign, Heidi Whitmore, and Tina Ding. 2009. “Trends in Underinsurance and the Affordability of Employer Coverage, 2004–2007.” Health Affairs 28 (4): w595–606. Merlis, Mark. 2011. “The Affordable Care Act and Employer-Sponsored Insurance for Working Americans.” Washington, DC: Academy Health. Office of the Assistant Secretary for Planning and Evaluation. 2016. “Health Insurance Marketplaces 2016 Open Enrollment Period: Final Enrollment Report.” Washington, DC: United States Department of Health and Human Services. Pope, Gregory C., Henry Bachofer, Andrew Pearlman, John Kautter, Elizabeth Hunter, Daniel Miller, and Patricia Keenan. 2014. “Risk Transfer Formula for Individual and Small Group Markets under the Affordable Care Act.” Medicare & Medicaid Research Review 4 (3): E1–23. Linda J. Blumberg is a senior fellow in the Health Policy Center at the Urban Institute, having joined in 1992. She is an expert on private health insurance (employer and nongroup), health care financing, and health system reform. Her recent work includes extensive research related to the Affordable Care Act (ACA); in particular, providing technical assistance to states, tracking policy decisionmaking and implementation efforts at the state level, and interpreting and analyzing the implications of particular policies. She codirects a large, multiyear project using qualitative and quantitative methods to monitor and evaluate ACA implementation in select states and nationally. Examples of other research include codirecting 22 state case studies of stakeholder perspectives on ACA implementation, assessing the implications of self-insurance among small employers on insurance reforms, and comparing the importance of employer and individual mandates in reaching ACA objectives. She also led the quantitative analysis supporting the development of a “Roadmap to Universal Coverage” in Massachusetts, a project with her Urban colleagues that informed the 2006 comprehensive reforms in that state. She received her PhD in economics from the University of Michigan. John Holahan is an Institute fellow in the Health Policy Center at Urban, where he previously served as center director for over 30 years. His recent work focuses on health reform, the uninsured, and health expenditure growth, developing proposals for health system reform most recently in Massachusetts. He examines the coverage, costs, and economic impact of the Affordable Care Act (ACA), including the costs of Medicaid expansion as well as the macroeconomic effects of the law. He has also analyzed the health status of Medicaid and exchange enrollees, and the implications for costs and exchange premiums. Holahan has written on competition in insurer and provider markets and implications for premiums and government subsidy costs as well as on the cost-containment provisions of the ACA. Holahan has conducted significant work on Medicaid and Medicare reform, including analyses on the recent growth in Medicaid expenditures, implications of block grants and swap proposals on states and the federal government, and the effect of state decisions to expand Medicaid in the ACA on federal and state spending. Recent work on Medicare includes a paper on reforms that could both reduce budgetary impacts and improve the structure of the program. His work on the uninsured explores reasons for the growth in the uninsured over time and the effects of proposals to expand health insurance coverage on the number of uninsured and the cost to federal and state governments. Erik Wengle is a research associate in the Health Policy Center at the Urban Institute. His research is focused primarily on the implementation of the Affordable Care Act and the future outlook of the Health Insurance Marketplaces. Wengle graduated from the University of Maryland in 2013 with a BS in environmental science and policy. This brief was funded by the Urban Institute. The views expressed are those of the authors and should not be attributed to the Urban Institute, its trustees, or its funders. Funders do not determine research findings or the insights and recommendations of Urban experts. Further information on the Urban Institute’s funding principles is available at www.urban.org/support. The authors are grateful for helpful comments and suggestions they received from Paul Ginsburg and Cori Uccello.